Only 2 days to go until apple day! The apple pile is growing despite the poor harvest this year. We took the kids scrumping to Kate’s mum’s orchard last weekend and we got a good haul (thanks to Carla and Michael). We also woke up a surprising number of hibernating ladybirds there. Collecting apples in Carla and Michael’s orchard. We’ll be starting around 10 a.m., aiming for the first pressing at around 11 a.m. There’s a lot of sterilising to be done in the early morning, so if want to help out with that, you’d be very welcome. Lunch will be served at around 1 p.m.
We’ll carry on until the apples run out, which is usually about 5 p.m. Remember we especially need volunteers at the end of the day to help clean up and we’ll keep some special treats back for those who do! 1. Apples – there’s no such thing as too many apples so don’t give up on any last-minute scrumping! 2. Containers for juice – make sure you bring along a couple of clean bottles to take home some juice, e.g. old milk containers. Give them a good clean in hot soapy water and a rinse. The juice will last a couple of days in the fridge or can be frozen and enjoyed later. 3. If you can, bring some food. As usual I am preparing overnight pork with apple sauce, ideal when you’ve worked up an appetite pressing apples. The brilliant Balzano’s Delicatessen has donated the bread rolls again. If you can bring some kid-friendly snacks or cake it would help a lot. We’ve had an unoffical bake-off for the last couple of years – extra points for anything involving apples. We’ve got a couple of barrels of cider and a whole load of bottles from last year so that you can take some home with you. All we ask in return is that you get involved and help make the day amazing for everyone. Jane, Phil and the Cambridge Apple Day crew. We are delighted to announce that the Cambridge Apple Day will be back for its 9th year on Sunday 7th October 2018. It was great to see the kids getting really involved into the process – even setting up the press themselves and leaving more time for the grown-ups to drink cider do the really important stuff. Anyway, back to this year. Details will follow in the coming weeks. For now, hold the date in your diary and start spotting apple trees for scrumping. Apple crops look to be a bit patchy this year due to the hot weather, many of our usual haunts have had very poor crops. So keep an eye out for any promising trees with apples that haven’t fallen yet. It would be really handy if you could let us know whether you’re coming so we can plan for catering, so please email us to let us know you’re coming. Apologies to the many people who’ve asked, but the Cambridge Apple Day is still an invite only affair. We currently hold it in Phil and Jane’s back garden, and while we want to open it up to the public one day, we aren’t able to do that yet. Looking forward to more appley goodness on the 7th! Beautiful spartan apples look almost too good to press! Fingers crossed it stays that way! If you haven’t confirmed you’re coming yet, then please email Jane or Phil, it’s really handy for us to be able to plan for catering. We’ll start the fun at around 10.00am and aim for the first pressing at around 11.00am after which the press will be running all day, with a short break for lunch at 1pm. We’ll carry on until we run out of apples or steam (usually around 5pm), but we always need a hand clearing up, so please do stick around if you can. Make sure you bring along a couple of clean bottles to take home some juice, e.g. old milk containers. Give them a good clean in hot soapy water and a rinse. The juice will last a couple of days in the fridge or can be frozen and enjoyed later. I’ll be preparing overnight pork with apple sauce and sage and onion stuffing as usual, ideal when you’ve worked up an appetite pressing apples! We’ve got a LOT of last year’s cider to work through and, of course, there will be many gallons of fresh apple juice. What’s not to like? Just three weeks to go until Cambridge Apple Day 2017 (which is on Sunday 8 October) and the apple scrumping has started. Jane, Kate, and Sarah braved the showers in Cambridge today, taking all five monkeys with them to scrump the apples at one of our favourite spots (Kate’s mum’s house). They brought home a very respectable 6 sacks with a great mix of eaters and cookers. It is something of a tradition at this time of year for me to declare the apple tump open for business. What’s an apple tump? Basically, it’s a wooden box that we use to store the apples in the run up to apple day. This year there is no tump. Why? One of the problems with tumps is that the apples at the bottom tend to be in pretty bad shape by the time Apple Day comes around. In recent years we’ve used sacks to store some of our apple harvest and found that they keep the apples in better condition. So this year, we’re experimenting with storing all of the apples in sacks. Ask before you scrump, but don’t be afraid to ask. Most people with apple trees don’t really know what to do with all of their apples, and you’ll probably be doing them a favour by picking them. 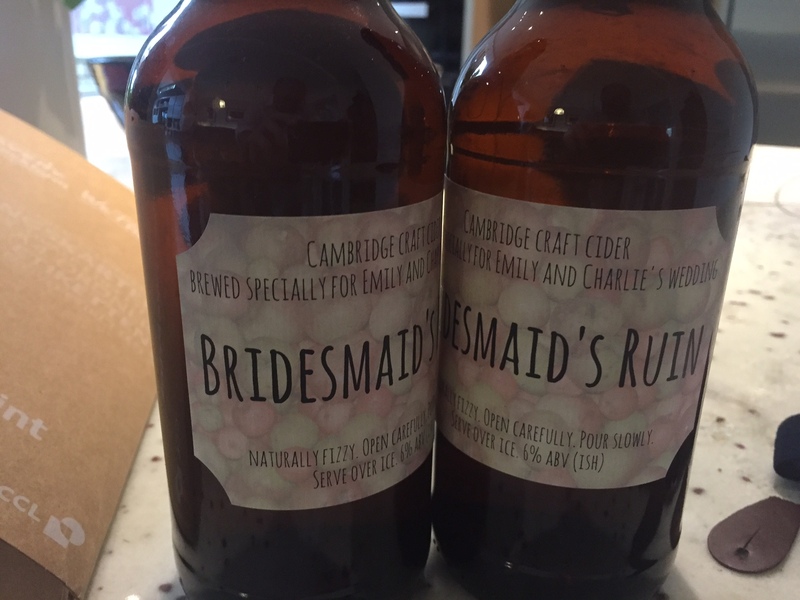 If you need an incentive, we’ve got some delicious bottled cider from last year available. Come and get a few bottles to give to people to say thanks for the apples. We take any type of apple. We follow the centuries old recipe for cider making that involves having a great mix of cider apples, eaters, cookers and crabs. Sweet or sour we want them all. Windfalls are fine as long as they aren’t from orchards with animals in. While we run all of our fruit through a bath of disinfectant (followed by a fresh water rinse) before pressing, animal poop can carry some seriously nasty bacteria and bugs, so if there’s any risk, leave them out. Throw away anything with mold on, but a bit of bruising isn’t usually a problem. If you’ve got access to apples, but need some help scrumping, get in touch and we’ll send out some of our wonderful volunteers to help. If you can store the apples yourself before the big day, great. Otherwise, feel free to drop them at Phil and Jane’s house. We’ve got lots of sacks here, so either collect some before your scrumping trip, or fill them up when you get here. I am delighted to announce that the Cambridge Apple Day will be back for its 8th year on Sunday 8th October 2017. I can hardly believe that it’s been almost a year since the last one. I was also more than a little embarrassed to find that I didn’t update the blog after last year’s event. No excuses, other than it took me a longer than usual to recover after we produced a truly epic 140 gallons of apple juice. About 15 of those gallons were consumed as lovely, fresh juice; leaving something like 125 gallons to be turned into cider. There’s no getting away from the fact that 2016 was a bumper year for cider production. We also managed to make real progress on batch control and measurement, including experimenting with different yeasts and measuring acidity for the first time. That’s what happens when you have scientists on the team. I’ll do a separate post on what we learnt and the challenge of processing that amount of cider another day, but for now, I’ll just say that I am very proud of what we’ve achieved. The batches were all good last year, ranging from 5.5% to 6.5%, very dry, and wonderfully fizzy in the bottle. As always, the part we’ve enjoyed most is giving it away. Volunteers and fruit donors have taken hundreds of bottles away already to enjoy over the summer. There’s lots left, so if you haven’t yet sampled last year’s vintage (or if you’d like some more), pop round and get some. 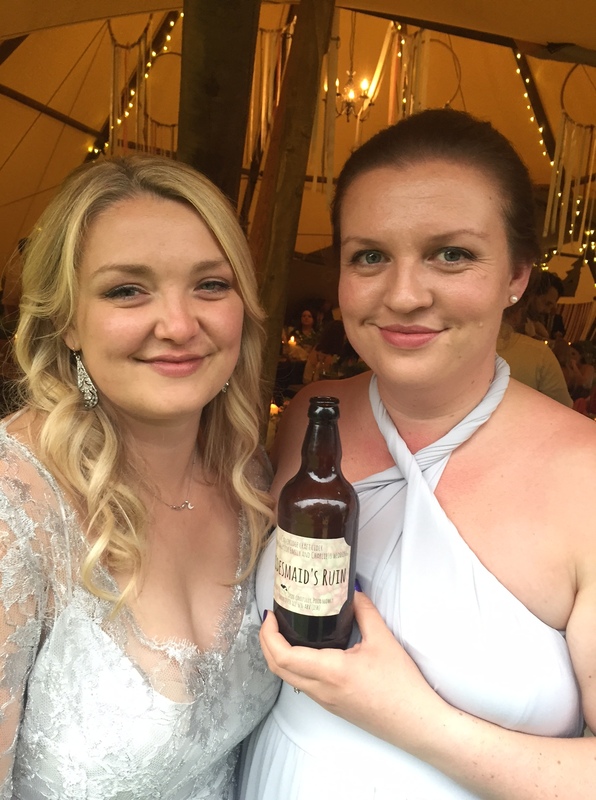 My favorite donation this year was to Emily & Charlie’s wedding, which we – rather prophetically – branded “Bridemaid’s Ruin”. Apple day is about juice and cider, but it’s also about community. Basically, it’s a lot of friends, neighbours, friends of friends, friends of neighbours, and neighbours of friends getting together to celebrate the harvest. Details will follow in the coming weeks. For now, hold the date in your diary, start spotting apple trees for scrumping, and email me to let me know you’re coming. Dylan (9YO) said to me a few weeks ago that Apple Day was his favorite celebration of the year. Even more so than Christmas and birthdays. His reason? “Because there’s so much juice, so many friends, so much food, and everyone’s just, y’know, happy”. We hold Cambridge Apple Day in our back garden, so we aren’t really able to open it up to the public. Every year I get an email or two that suggests we should stop calling it “Cambridge Apple Day” unless we’re prepared to open it up to everyone who lives in Cambridge. Respectfully, I don’t agree, but we are super keen to help anyone who is interested in holding their own Apple Day event in and around Cambridge. We are happy to loan our kit (for a modest donation), provide advice, help out in person, and of course we share everything we’re learning on this blog. So please don’t hesitate to get in touch through the comments or on our facebook page if you’re interested in getting involved. It’s Friday night and we’re busy making last minute preparations for Cambridge Apple Day this Sunday. The good news is that the BBC is still predicting good weather (phew). Unfortunately for those last minute scrumpers, Saturday looks like an absolute shocker, with rain predicted to tip it down from early afternoon until late into the night. Don’t let that deter you though. We need more apples, and a little rain never hurt anyone, did it? Thanks to some sterling work from the Colligans, McBriens, Uptons, Adams, Suttons, miscellaneous neighbours, and the 28th Cambridge cub scouts, we’ve gathered quite a decent pile already, but we definitely need more. See the earlier blog post for advice on scrumping and get out there! If you haven’t confirmed you’re coming yet, then please respond to the Eventbrite invite that is languishing in your inbox, or email phil at the usual email address. We’ll start the fun at around 10.00 a.m. and aim for the first pressing at around 11.00 a.m. after which the press will be running all day, with a short break for lunch at 1 p.m.
We’ll carry on until we run out of apples or steam (usually around 5 p.m.), but we always need a hand clearing up, so please do stick around if you can. Jane is preparing overnight pork with apple sauce again, ideal when you’ve worked up an appetite pressing apples. The brilliant Balzano’s Delicatessen has donated the bread rolls. If you can bring some kid-friendly snacks or cake it would help a lot. There is now an informal Great Apple Day Bake Off, which Kate Wilsher won last year by popular acclaim with her Ginger cake. Challengers are welcome to try their luck. We’ve got a couple of barrels of last year’s cider to work through and, of course, there will be many gallons of fresh apple juice. What’s not to like? Just one week to go until Cambridge Apple Day and this is the weekend for scrumping. I’ll be building the tump this weekend, which means we’re ready for you to drop off your apples. Last year was an amazing year for apples. Incredible variety and a bigger pile than we’ve ever managed to gather before. Let’s see if we can do even better this year! Which is where you come in… we need everyone who can to get scrumping this weekend. We follow some simple rules here at the Cambridge Apple Day. 1. Ask before you scrump, but don’t be afraid to ask. Most people with apple trees don’t really know what to do with all of their apples, and you’ll probably be doing them a favour. If you need an incentive, we’ve got some delicious bottled cider that’s ready now. Come and get a few bottles to give to people to say thanks for the apples. Finally, if you haven’t confirmed you’re coming to Apple Day this year, please get in touch and let us know. We’d love to see you there.